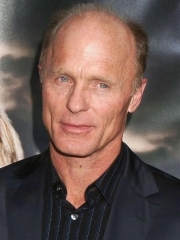 Edward Allen "Ed" Harris is an American actor, writer, and director, known for his performances in Appaloosa, The Rock, The Abyss, Apollo 13, A Beautiful Mind, A History of Violence, and The Truman Show. Harris has also narrated commercials for The Home Depot and other companies. He is a three-time nominee of the Academy Award for Best Supporting Actor, along with an Academy Award for Best Actor nomination for the title role in Pollock. Harris's first important film role was in Borderline with Charles Bronson. In Knightriders he played the king of a motorcycle-riding renaissance-fair troupe in a role modeled after King Arthur. In 1983, the actor became a star, playing astronaut John Glenn in The Right Stuff. Twelve years later, a film with a similar theme led to Harris being nominated for an Academy Award for Best Supporting Actor for his portrayal of NASA flight director Gene Kranz in Apollo 13. Further Oscar nominations arrived in 1999, 2001 and 2003, for The Truman Show, Pollock and The Hours, respectively. He also portrayed a German sniper, Major Erwin König, in Enemy at the Gates. More recently, he appeared as a vengeful mobster in David Cronenberg's A History of Violence and as a police officer alongside Casey Affleck and Morgan Freeman in Gone, Baby, Gone, directed by Ben Affleck. In 2007, he appeared in National Treasure: Book of Secrets as antagonist Mitch Wilkinson. Along with theatrical films, he has starred in television adaptations of Riders of the Purple Sage and Empire Falls . Harris made his cinema directing debut in 2000 with Pollock, in which he starred as the acclaimed American artist Jackson Pollock. He also has portrayed such diverse real-life characters as William Walker, a 19th Century American who appointed himself president of Nicaragua, in the film Walker; Watergate figure E. Howard Hunt in the Oliver Stone biopic Nixon and composer Ludwig van Beethoven in the film Copying Beethoven. Harris has directed a number of theater productions as well as having an active stage acting career. Most notably, he starred in the production of Neil LaBute's one-man play Wrecks at the Public Theater in New York City and later at the Geffen Theater in Los Angeles. For the LA production, he won the LA Drama Critics Circle Award. Wrecks premiered at the Everyman Theater in Cork, Ireland and then in the US at the Public Theater in New York. Harris and wife Amy Madigan starred together in Ash Adams' indie crime drama Once Fallen, alongside Brian Presley, Sharon Gless, Adams himself, and a large all-star cast. It was released in 2010. Whole or part of the information contained in this card come from the Wikipedia article "Ed Harris", licensed under CC-BY-SA full list of contributors here.